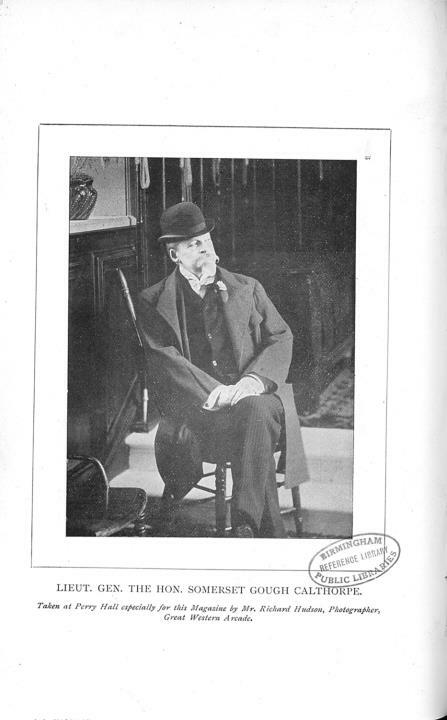 Description:A Biography of Somerset Calthorpe, owner of Perry Hall in 1899, taken from the Handsworth Magazine. Lieutenant General the Hon. Somerset Gough Calthorpe is the fourth son of Baron Calthorpe of Calthorpe, County Norfolk, by Charlotte, eldest daughter of Henry Charles, sixth Duke of Beaufort and was born in London, on January 23rd, 1831. On the 23rd of May, 1848, he entered the army as a cornet in the 8th Hussars, detaching for ten months to the Guarde Husar regiment in Hanover. Mr Calthorpe served in the field on the Elbe and afterwards at Altenberg. Rejoining his regiment he was promoted to the rank of lieunant 23rd May 1851, was attached to the staff as Deputy Assistant Quarter-master General during the camp at Chobham in 1853 and from March 1854 to July 1855 discharged the duties of aide-de-camp to Field-Marshal Lord Raglan in the Crimea. On September 4th, 1855, he was promoted to the rank of Captain and on November 2nd of the same year to that of Brevet-major. We find him from January 1856 to August 1857 acting as aide-de-camp to the Earl of Carlisle, Lord Lieut. of Ireland. Obtaining his majority, 22nd July 1856, he was gazetted to the 5th Dragoon Guards 2nd Dec., 1859 and succeeded to the Lord Lieut. Colonelcy of the regiment (the 15th February 1861) on the retirement of Sir Thomas M Mahon. In 1866 he was appointed Colonel (for length of service) retiring in 1869 on temporary half-pay. He was appointed Major-General in the army October 1877 (dated July 1870) and placed on reserved list with rank of Lieutenant-general 1881. He became Colonel-in-Chief of the 5th Dragoon Guards in 1892. His decorations are numerous. They include the Crimean medal and four clasps, the 4th class of the legion of honour and the 5th class of the order of Medjidie, for his services at the battles of Alma, Balaclava and Inkerman and the siege of Sebastopol. He is the author of “Letters from Headquarters in the Crimea, by a Staff Officer” a work which had a considerable vogue. It is very outspoken and contains much valuable information. Some idea of the scope of the book may be gleaned from the preface to the first edition, which informs the reader that it “was written in the Crimea in the first instance without any intention of publication, but merely as a series of letters addressed to friends in England. From the circumstances of the writer having been attached to the headquarter staff of the army in the east, he had many opportunities of hearing and judging of the opinions given and the difficulties to be overcome by the generals of the allied armies, more especially of course as regards the English Commander-in-chief, the late Field-Marshal Lord Raglan. Another circumstance which induced the writer to publish the volumes was that on his return to England he found so many opinions and motives ascribed to Lord Raglan, which the Field-Marshal never entertained and so much calumny and abuse unjustly heaped upon his head, that the writer could not forbear, however feebly, from giving his version of some of the illustrious commander’s actions and deeds and the difficulties with which he had to contend, as much in Council as in the field.” The book was published in 1858 and is still exceedingly interesting. The gallant subject of this brief sketch is well-travelled and a well-read man. He is known in practically every capital in Europe and has travelled in Canada, the United States and our Colonies. He has held the position of Chairman of the Isle of Wight County Council since the formation of the authority eight years ago; is Chairman of the magistracy of the Isle and for eleven years has acted as Chairman of the Isle of Wight Conservative Association. 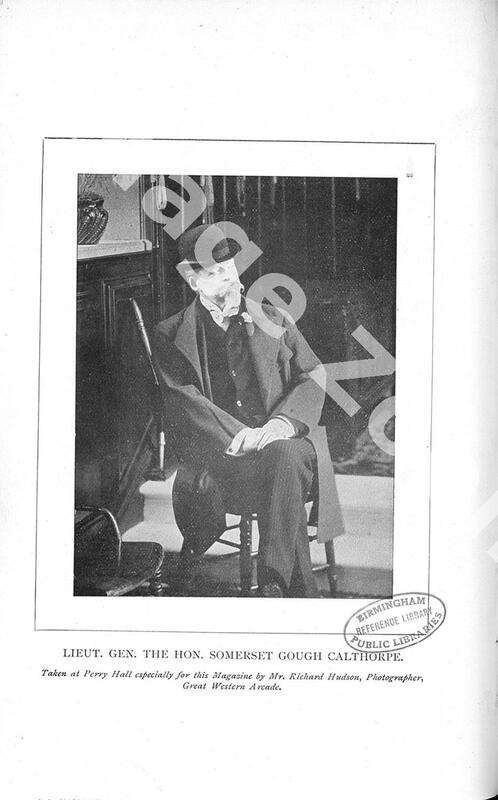 To come nearer home, he is a Justice of the Peace for Staffordshire and also for Worcestershire and is very naturally interested in all that concerns the well-being of Perry Barr, where his magnificent seat, Perry Hall, is situated. Once only has his ambition been directed Parliament-wards. He contested Hastings in the Conservative interests in 1868 against Lord Brassey, fighting the election with characteristic pluck, but failing to capture the seat. We are pleased to state that, inasmuch as he is resigning the Presidency of the Isle of Wight Council and giving up other public work, he will in the future reside for at least five or six months in the year at Perry Hall, the remainder of the year being spent in London or abroad. Several wings have been added to the structure since, in 1669, it came into the possession of Sir Henry Gough. The hall and the park are alike replete with features of interest upon which, if we had the space ay our command, we should be delighted to dilate. Thanks to the kindness of Mr Calthorpe and his good lady, the tenantry and indeed, the public generally have many opportunities of inspecting for themselves the famous seat of the Calthorpe family. The local Horticultural Society held their last exhibition in the park and on the occasion of the Diamond Jubilee Celebrations the park was the scene of the villagers’ rejoicings. Nearly in the centre of the park there is a clump of trees known as the Kings Standing. This is the historic spot where Charles I erected his standard at the commencement of the civil war, which resulted in the beheadal of the unhappy monarch and was used as a rendezvous for the royal forces.